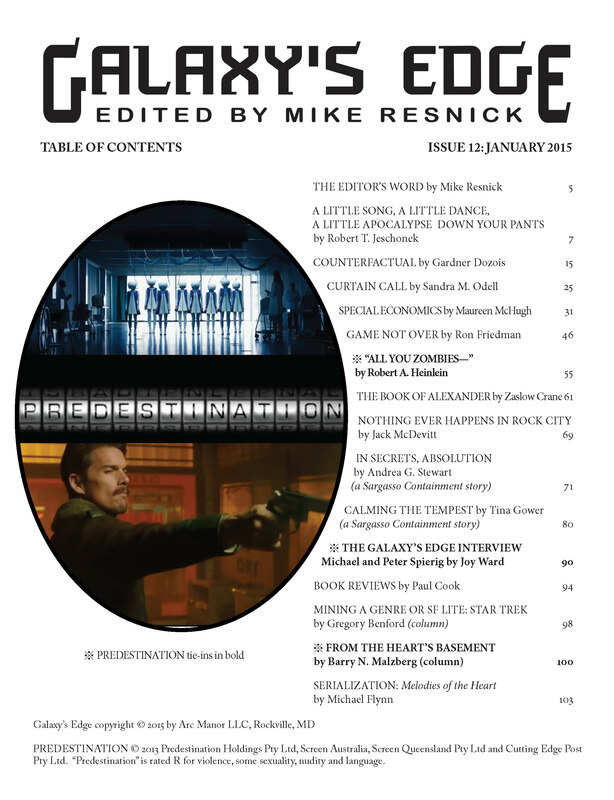 “All You Zombies”, the 1959 story on which the forthcoming film Predestination (starring Ethan Hawke) is based, appears in the January 2015 issue of Galaxy’s Edge along with an interview with the movie’s directors (the Spierig brothers) and a commentary on Heinlein by Barry N. Malzberg. Much of Heinlein’s large body of work shares with “All You Zombies” a remarkably predictive aspect. An extension of Heinlein’s earlier time-travel paradox, “By His Bootstraps” (published 18 years earlier in Astounding Science Fiction), “All You Zombies” is regarded as one of Heinlein’s most visionary works and certainly his most audacious … it has been an influence for many subsequent stories and novels exploring the maddening paradox of time travel and is probably still the best work on the subject. Galaxy’s Edge magazine is proud to offer this groundbreaking work to new readers along with an interview with the directors of the movie Predestination. Barry N. Malzberg’s article offers further insight into the life of Robert A. Heinlein and the writing of the original story. And in the March 1952 Galaxy magazine Heinlein’s long short story “The Year of the Jackpot” depicts a contemporary United States whose cultural mores and institutions have come askew and have led to what Heinlein calls “the crazy years” in which social conditions and their causation seem to have become detached from one another. Heinlein’s premise is that extreme social activity has been the cause of this disruption but his sunspots bear a frightening similarity in their effect to 9/11. The United States has fallen to the polarization of extreme reaction and libertarianism and those Crazy Years are a voyage toward apocalypse. Heinlein was recognized immediately after his first published story, “Life-Line” in the July 1939 Astounding, as a new kind of science fiction writer, one who had an utter command of extrapolation, who could draw a line from present technology and social network to a set of outcomes which (although they would differ) were utterly convincing. His extrapolatory ability continued through his career; his ’60s novels Stranger In A Strange Land and The Moon Is A Harsh Mistress (the former coming just a year after “All You Zombies”) forecast the enormous social and sexual changes of the ’60s and in his last works such as To Sail Beyond the Sunset he posited a future of mystical evolution already nascent. He was a science fiction writer who not only created and shaped his succession but who reached beyond literary influence to insights as or more important than those of McLuhan or David Riesman. “All You Zombies” was his greatest work short of his novels and probably his most gripping. 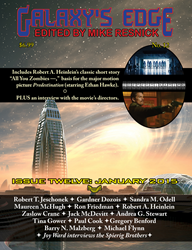 Galaxy’s Edge is a bimonthly science fiction magazine edited by Mike Resnick and published by Phoenix Pick, the science fiction and fantasy imprint of Arc Manor Publishers, Rockville, Maryland. It is available online, as a digital download for most common e-readers and in paper. For more information on the works of Robert A. Heinlein and the Heinlein Prize Trust please visit http://www.heinleinprize.com. For more information on Galaxy’s Edge magazine please visit http://www.GalaxysEdge.com or use the contact information provided.